In the latter few days of February, 1999, the National Federation of the Blind became a part of a growing Internet shopping network entitled GreaterGood.com. This shopping network offers those who are online at the National Federation of the Blind Web site (<www.nfb.org>), to go to the National Federation of the Blind shopping village. This is a place at which Web surfers can select and purchase merchandise from a large number of stores such as Amazon.com and J. Crew. The officials who have put this company together include some of the most notable business people in the United States. Some of these have been top members of the administration and senior politicians. The agreement we have made with them is that we will receive 5% of the purchase price for each item purchased through our Web site. In addition, those who enter the shopping services throughout the GreaterGood.com Web site may select the National Federation of the Blind to receive the 5% charitable donation from among the charities listed on the Web site. Some people have contacted us saying that not all of the vendors listed in the National Federation of the Blind shopping village have accessible Web sites. This is quite true. However, we are working with the vendors to encourage them to increase accessibility to their Web sites, and we hope that we will be able to make this whole service much more usable by the blind. In the meantime we believe that this service will be usable in many instances by blind people and that it will raise funds for the continuing work of the Federation. If you have suggestions for improving this service, please let me know. I cannot promise that we will do everything you might want, but we will do our best to improve the accessibility of the service. Beginning July, 1999, the magazine Discovering Archaeology will be available in large print. This edition will carry informative articles about the latest ground-breaking archaeological research from around the world on land and under water. The magazine is published quarterly, and the large-print edition will be in 17-point type on non-glare paper and will carry the NAVH seal of approval. The annual subscription rate is $19.95 (plus $7 if mailed to non-U.S. countries) and will be sold on newsstands for $5.95 per issue. Readers can subscribe by visiting the Web site at <www.discoveringarchaeology.com> or by calling (877) 383-0878. Type 'n Speak with a revision date of July 26, 1994, for $700 or best offer. Also for sale, Toshiba laptop computer with 4MB RAM and a 260MB hard drive. Also included is the Keynote PC voice card, best offer. E-mail: sklug@cyberstation.net. Call (940) 761-3431 or write to Sharon Klug, 12 Chip-n-Dale Circle, Wichita Falls, Texas 76303. Listening to Windows 95, a new training kit for users who are blind or visually impaired, is now available from the American Printing House for the Blind. The kit includes tactile and large-print guides to screen layouts, a manual available in four accessible media, and interactive auditory software in CD-ROM format to teach Windows basics. Unlike other tutorials, the CD-ROM format of Listening to Windows 95 allows random access to a structured training content. Users can learn the main system and application features of Windows 95, including Introduction, Desktop features, Explorer, WordPad, Help, Control Panel, and Internet Overview. The CD-ROM contains quality audio, produced by APH's professional narrators. The product was developed as a joint project of TECSO, Inc., (Technology and Society) of Montreal and APH. To order, contact American Printing House for the Blind, 1839 Frankfort Avenue, P.O. Box 6085, Louisville, Kentucky 40206-0085, (502) 895-2405, (800) 223-1839, or fax (502) 895-1509. The e-mail address is <info@aph.org>. The Web address is <www.aph.org>. Speech Expressor is now available from the American Printing House for the Blind (APH). It allows the audio book listener to change the speed of recorded material without the change in sound quality usually experienced using older compression systems. Since Speech Expressor users can digitally adjust the pitch of the recorded voice to compensate for a change in speed, they will be able to 1) speed up audio recordings to read more material more quickly without an increase in pitch, 2) slow recorded material down for more concentrated listening without a decrease in pitch, 3) compensate for hearing loss in certain higher pitch ranges. Speech Expressor is compatible with any sound source with variable-speed control, including several APH cassette recorder/player models and National Library Service Talking Book players. It will also work with devices that do not have a variable speed control, such as commercial tape players and radios. In these only the pitch of the voice can be changed, not the speed. The cost is $125, and the unit can be ordered from the American Printing House for the Blind, 1839 Frankfort Avenue, P.O. Box 6085, Louisville, Kentucky 40206-0085, (502) 895-2405, (800) 223-1839, or fax (502) 895-1509. The e-mail address is <info@aph.org>. The Web address is <www.aph.org>. It's back and better than ever. Many people participated in the Lunch Link in Dallas. We have heard rumors that some new friendships and romances were started, so we are going to do it again. Thanks to the feedback we received from last year's participants, the questionnaire has been improved so that we can link you with the best match possible. Don't miss out on the fun. If you are looking for a new friendship or a bit of romance at the NFB convention in Atlanta, join the Lunch Link today. Here's how it works. You answer a series of questions about yourself and the type of person you would like to meet. The questionnaire is available in large print and Braille. It is quick and easy to do. Then we put your information into our computer, which will find the best match for you. We will share your name and state affiliate with that person and vice versa. Your name may be given to up to three additional people. The service is confidential. Remember that we can not guarantee that the person you are linked with is someone with whom you are not acquainted. Why stand in long lines in Atlanta to get your questionnaire? Request one today by contacting Lynn Mattioli, 817 Park Avenue, Apartment 7, Baltimore, Maryland 21210, or call (410) 625-0076. Be sure to tell us which format you prefer (large print or Braille). Once you have circled your answers, return it to the above address with your payment (make checks payable to the NFB of Maryland). The cost is $5 per submission. Or you can get a questionnaire at our table in the exhibit hall on Thursday, July 1, or Friday, July 2. The deadline for joining the Lunch Link is 5 p.m. on Friday, July 2. Friday night the computer will do its magic. You must return to the exhibit hall on Saturday, July 3, to pick up the name of your match (which will be in a sealed envelope). We will give you this information in person only. Don't miss out on your link. Join the Lunch Link today. You have nothing to lose except wondering whom you will be dining with in Atlanta. 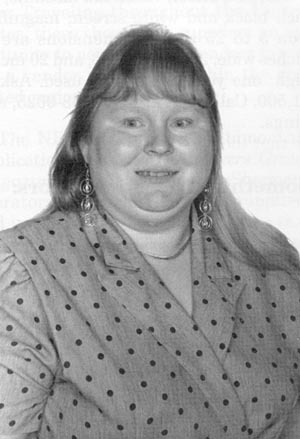 Karen Mayry, President of the NFB of South Dakota, reports that Federationist Julaine Arient-Rollman, a senior rehabilitation counselor at the South Dakota Division of Rehabilitation Services, was honored on February 11, 1999, for her assistance to people with disabilities. She received the NISH excellence award. The National Industries for Severely Handicapped is a national non-profit organization that helps provide employment for people with severe disabilities. Congratulations to Ms. Arient-Rollman. Enliven Enterprises announces two new Word-Hunt books designed for the pleasure of visually impaired puzzle lovers. Word Safari games come in two sizes of print (one-half-inch and one-inch). These books sell for $3.49 each plus $1 shipping and handling. (Pennsylvania residents must add sales tax.) A quarterly magazine is in production to begin sale in the spring of 1999. For more information contact Mari-Cay Hartman, 2330 Grove Street, Allentown, Pennsylvania 18104-2529, (610) 439-3552, e-mail: <enlive@enter.net>. I have a Betz music notation device for sale. It is a board representation of a printed music staff, accompanied by a myriad of music symbols, including notes and other markings, which can be stuck onto the board to show what printed music looks like. Includes case and Braille instructions. The case is slightly scratched, but the device is like new; it has hardly been used. Great for the music student. Will sell for $175. We paid much more than this. For more information contact Olivia Ostergaard, 2740 West Olive Street, 104, Fresno, California 93728-2457, (559) 486-2126. The Arkansas School for the Blind Alumni Association will hold its annual convention/reunion at the school during the weekend of June 4, 5, and 6, 1999. All graduates, former students, and friends of the school are invited to attend. Registration fees, including meals and lodging, will be $22 per person. For more information contact Travis or Margaret Johnson, 302 Woodford Place, Paragould, Arkansas 72450, (870) 236-8498. If you know you will not be able to attend this year but would like to be added to our mailing list, please contact us. In the March, 1999, issue we carried an announcement about a number of tours available through the Campanian Society. The URL for the organization has recently changed. The new Web site address is <http://www.campanian.org>. Also, in the March issue Joe Mar invited correspondence from those who share his interests. He now stipulates cassette letters only and corrects his address to read 20401 Soledad Canyon Road, Space 522, Canyon Country, California 91351-2556. Xerox Outlook vision aid machine, 14-inch black and white screen; magnification 5 to 25 times; dimensions are 16 inches wide, 23 inches deep, and 20 inches high; one year old; hardly used. Asking $1,500. Call Chris at (330) 633-0025, evenings. In the spring of 1998 the National Federation of the Blind established an independent company called the National Buyers Group (NBG). The company was organized to assist the growing number of blind entrepreneurs who participate in the federally-sponsored Randolph-Sheppard Program. Blind vendors throughout the United States take advantage of the National Buyers Group's collective buying strength. By identifying with the NBG, individual operators in the Randolph-Sheppard Program gain eligibility for allowances, discounts, rebates, marketing programs, and reduced or national pricing. The NBG's mission is to assist blind vendors in forming these types of relationships with their suppliers. Working with state licensing agencies and committees of blind vendors, the NBG promotes approximately twelve to fourteen food and technology shows each year. Traveling throughout the United States, these shows give suppliers an opportunity to network with vendors to create a vendor sales base within the promoted regions. The NBG also produces a bimonthly publication, the National Buyers Group Magazine, to keep Randolph-Sheppard operators in touch with their suppliers and up to date on important issues that may affect their businesses. Its readers are owners, managers, and key decision-makers from over 3,500 Randolph-Sheppard facilities across the United States. The magazine's features include new products, recipes, market analyses, business tips, calendars of events, legislative beats, regulatory issues, and feature articles. NBG on the Web is the companion to the bimonthly magazine. It offers rich sponsor content and opportunities for advertisers to showcase their products and services with features such as company profiles, products, incentives, rebates, special promotions, recipes, and contact information. Check out the NBG Web site at <http://www.NBGMAG.com>. The NBG Web site is hot-linked to the National Federation of the Blind Web site at <http://www.nfb.org>. For further information about the National Buyers Group or the National Buyers Group Magazine contact John Martin at (410) 727-4027 or (410) 659-9314. Donna Balaski, DMD, of Waterbury, Connecticut, is interested in organizing a division for those in medical professions. The group will meet from 3:00 to 5:00 p.m., Friday, July 2. For more information contact Dr. Balaski at 66 Devon Wood Drive, Waterbury, Connecticut 06108-2302, (203) 753-7174, or e-mail <dlb13@snet.net>. Exceptional Art by Artists with Exceptional Challenges, Second Annual Juried and Invitational Show, October 21 to 24, 1999. This show is part of the Eighth Annual USArtists Exhibition at the 33rd Street Armory in Philadelphia. It is presented by the Women's Committee of the Pennsylvania Academy of the Fine Arts. Two-dimensional and three-dimensional pieces by artists with visual and auditory impairments, physical or mental challenges, personal or domestic violence, trauma and post-traumatic stress syndrome, and chronic or terminal illness will be eligible. Deadline for entry is June 15, 1999. For a prospectus send a stamped, self-addressed #10 envelope to Thom Duffy, USArtists99/PAFA Prospectus, 1301 Cherry Street 8th Floor, Philadelphia, Pennsylvania 19107. For more information call the USArtists office at (215) 972-0550. The International Braille Book Depository has been going forward rapidly. We've been posting new titles daily. The site will open with a minimum of 1,000 titles, ranging from your favorite children's bedtime stories to literary classics. There will be something for everyone. To help raise money for this project, we plan to bring a limited number of electronic books to sell during the 1999 National Convention. Included will be Walking Alone and Marching Together and the NFB Kernel Books. However, we want your suggestions about what else to have on hand for your reading pleasure. In addition to specific titles, we will offer sampler disks containing excerpts from various books in the depository. We will have both a children's sampler and an adults' sampler to give away during the convention. For those who do not yet have access to the Internet, there will also be a way to purchase these titles during the coming year. Those with Internet access will be able to download the titles from the depository. For more information about this project or to suggest books to translate during the coming year, become a translator, or assist with scanning books for translation, contact Peter Donahue at the following: Peter Donahue, Coordinator, International Braille Book Depository, International Braille Research Center, 100 Lorenz Road, Apartment 1205, San Antonio, Texas 78209, phone (210) 826-9579, e-mail <pdonahue@texas.net>. So you say you are attending the 1999 national convention in Atlanta, and you say you plan to gather recorded NFB literature in the exhibit hall. But do you have proper storage systems for all this vintage NFB material? The NFB of Illinois has the perfect solution for you. For a mere $3 each you can have your very own attractive white vinyl albums that accommodate a dozen cassettes. Our cassette albums come complete with clear sleeves front and back for print labels and ample space on the spine for Braille labels. Find the Illinois table in the exhibit hall, and take advantage of an opportunity to free yourself from toppling tapes. If you are unable to attend this year's National Convention, you may still avoid the dreaded cassette avalanche by sending a check or money order, made payable to NFB of Illinois, in the amount of $3 for each cassette album, to Stephen O. Benson, NFB of Illinois, 7020 North Tahoma, Chicago, Illinois 60646. D Square is a new fashion publication dedicated to making the feel and look of fashion design accessible. Our publication covers the latest fashion trends for men and women, reveals unbeatable shopping deals, reviews mall designs and happenings, and even interviews on-the-go designers. For more information call (610) 642-4442 or send an e-mail to <denise@touchthearts.org>. Call today and bring the world of fashion to your door.